I first saw Rita Hosking a few years ago when she had the lunchtime slot at a Festival and she struggled to capture the attention of a restless audience. With so many female singer-songwriters crossing my path in the ensuing time I’ve not given her a second thought; but after repeatedly listening to LITTLE BOAT it is my loss, not hers. To begin with I’m not really sure how to describe the album, as it only has 7 songs on it – does that make it an EP or LP? Whatever it is, it opens with Parting Glasswhich had me favourably comparing Rita to Nanci Griffith, Iris DeMent and Joan Baez. The song and accompanying guitar playing are both excellent and Rita’s voice has a charismatic warmth to it and you can feel the words coming straight from her heart. On Where Time is Reigning Rita’s daughter Kora plays the Claw-hammer banjo alongside Rita on guitar and husband Sean Feder on Dobro and the result is almost electrifying as they ponder the Universe and what lies beyond our eyes and minds. It’s difficult not to mention Dylan when reviewing a modern American Folk album but his shadow is definitely cast across Sierra Bound and Blow North West Wind; but for once I mean that in a positive way. Rita has obviously listened to a lot of His Bobness and his influence is there in her writing and possibly her phrasing but she can sing him under the table! I absolutely love the way Rita inhabits the character of a young woman making ends meet as a maid; who feels invisible to everyone around her in Clean. Her observations are wonderful as the girl goes about her business with ‘smile upon her face’ ‘buffing the hardwood floors and cleaning the double pane doors’ while dreaming of having the employers life for herself. This truly is powerful stuff and begs to be listened to over and over again by Politicians all over America and Europe…..but it won’t be. 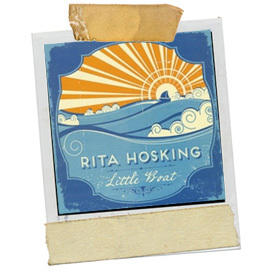 This mini-album oozes class from start to finish and Rita Hosking is a treasure waiting to be discovered by the masses; don’t miss out; you’ll regret it.